One of the first things that businesses do when they setup their CRM is that they setup their sales process inside of the CRM. Your sales stage setup is a critical first step. This allows managers to manage and build a pipeline for the business while giving tools to sales people to follow their individual sales progress. This article we are going to walk through how to setup sales stages inside of SugarCRM. The first thing that you need to consider when setting up your sales process is whether or not you are working in Professional or Enterprise versions of SugarCRM. If you are on Professional then you are going to be driving sales stage tracking directly from your Opportunities. If you are running Enterprise, then you have a choice to either do it through the Opportunity directly or at the revenue line item level. Do you use Opportunity only or Revenue Line Items? This is an important question that you need to ask yourself or work through the process. At Eligeo CRM we emphasis going through a robust CRM Strategy workshop to ensure that know how you want your sales process to operate within SugarCRM. The general way of looking at it though is that the Opportunity level gives you a fairly high level estimate of what amount you think you may achieve on a deal. If you’re only selling 1 single type of product, this could make sense. Your sales stage setup could be better off though if you wanted more granular information. The revenue line items option allows you to track an unlimited number of individual products that roll up into one opportunity. A great example of this is when you have multiple product lines. You may feel like one product is 90% likely to close whereas you have other up-sell opportunities that may fit into this opportunity as well. This can provide managers a better way of encouraging additional unit sales while also tracking performance of each individual product. The opportunity is high level so it’s more difficult to track the progress accurately. The sales stage configuration is the same for both Professional and Enterprise. First, you need to setup your sales stage configuration. Check out our blog post on how to create sales stages for more information on this. 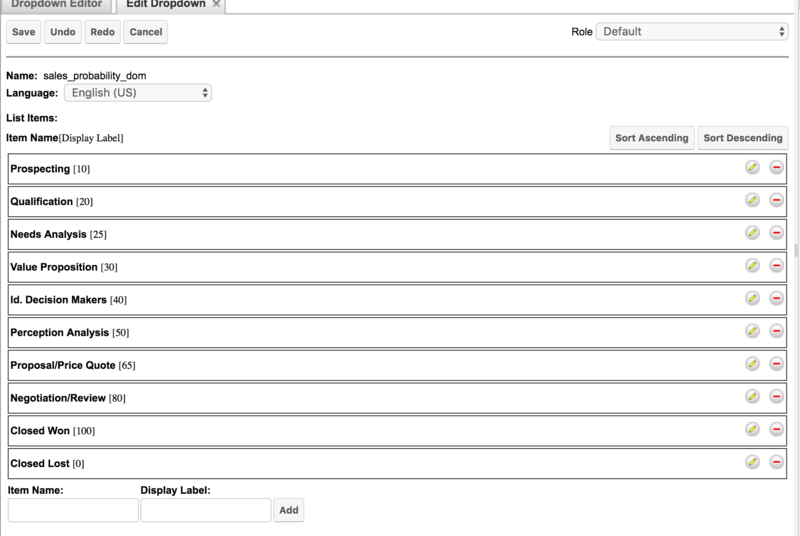 Once you’ve determined your sales stage setup, we have two drop down lists to update in Studio. To access them, you must be an administrator. Scroll down to the Developer Tools section. Click on the Dropdown Editor link. If you’ve followed the steps correctly, you should see the screen as shown above. There are a lot of lists in Sugar. We need to find two of them but we’ll start with one first. An easy way to find these lists is to do CRTL+F in Windows or CMD+F on MacOS. This will pop up a search box. The first one we are searching for is sales_stage_dom. This should highlight in your browser, the sales stage drop down list. Click on that link. This is a very simple index of options that are available for you to customize for your CRM. You can click and drag to re-arrange the order of the menus. The small pencil icon will allow you to edit the label. The minus sign will allow you to remove the entry. This is the easy part and it is your chance to take your developed sales steps and drop them into this list. You can click Save at the top when you’ve got your sales stages all setup properly. When you searched for sales stages you probably noticed a few different results pop up. We have a second list that we need to update once we’ve completed our sales stage. Before we do that, let me explain the different sales lists. Sales Stage – We just updated this one. Sales Status – This is for Enterprise customers that are using revenue line items to specify if an Opportunity is in progress or completed. Sales Status with Quote – This is to do with the Quotes module of SugarCRM. We are focused on the sales probability. 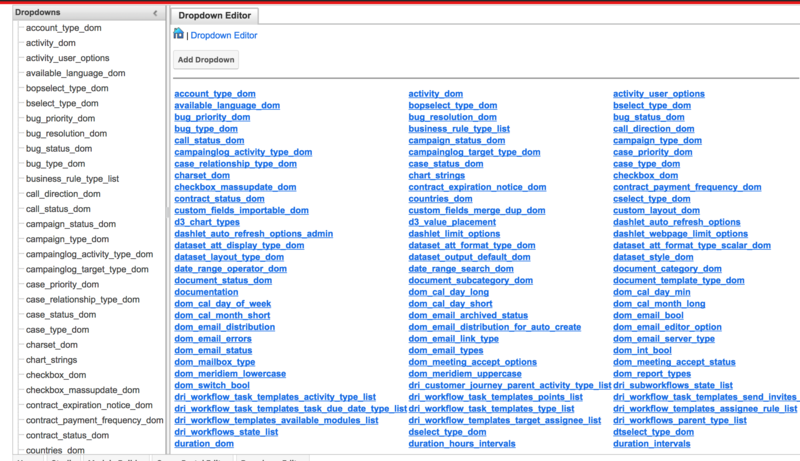 So go ahead and search for sales_probability_dom from your drop down lists screen and click on it. This screen is a little bit different. I want to talk about what sales probability has to do with anything in the CRM. It impacts a few areas, notably the Opportunity itself as well as the Forecasting tools. As you can see through the list of Sales Probabilities, the list matches up with the Sales Stage list. This is by design because we want to associate the selected sales stage with a number, rather a percentage. What we see is that if we make it to Proposal/Price Quote, we know that we have a 65% chance of closing the deal. Conversely, if we are at Prospecting, it’s at 10%. These numbers will need to be tweaked by you over time as these are just out of the box examples. Every business will evolve this and learn the chances of closing at different stages. That’s how we use it from an Opportunity perspective. From a Forecast perspective, we’re using that percentage to allocate dollars to our forecast amount. Example: We have an Opportunity with an Amount of $1,000 with a sales stage of Prospecting. This means our active funnel is only $100 because Prospecting is 10% chance of closing. Example: We have an Opportunity with an Amount of $1000 with a sales stage of Proposal/Price Quote. This means our active funnel is $650 because this sales stage is 65% likely to close. Now that you have an understanding of how probabilities work, you can update the table. 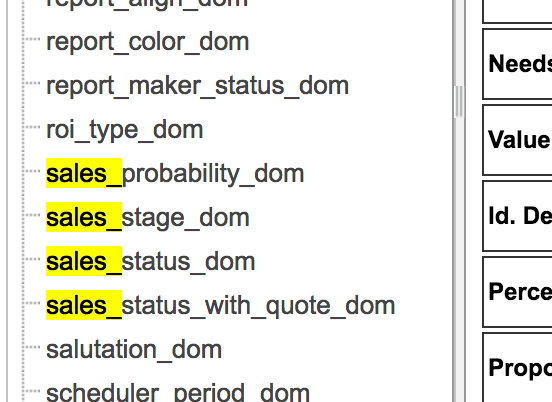 Simply make sure that the Item Name on your lists match up between sales_stage_dom and sales_probability_dom. The label will be the actual percentage for probability. Click Save and that’s it. You’ve updated your sales stages. Create an opportunity and change the sales stage to see that the Probability value is actually changing and updating. There is a field called Probability % that is shown by default. If you’ve setup forecasting, you should be able to review these percentages within the Forecast tool. Create a report showing the sales stages. That’s it for setting up sales stages. 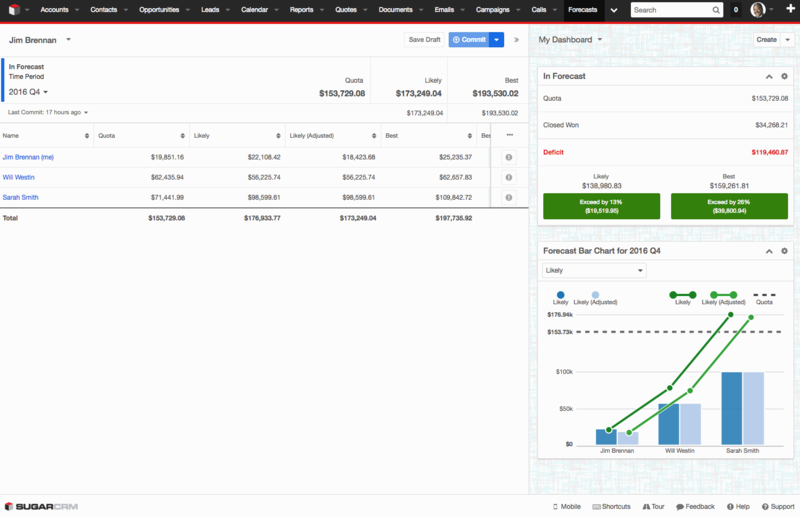 We hope you found this article helpful in getting your sales stages setup in SugarCRM.